Travel Pillows can make a plane flight or long bus trip that bit more comfortable. However, deciding what is the best travel pillow for you can be difficult. There are several different styles and materials to choose from and not all types will work for everyone. Many people can’t be bothered, claiming that travel pillows are ineffective. Unfortunately, these people have usually just tried the simple inflatable neck pillows – there are a whole range of types and options that they might find more comfortable. If you’re interested in selecting a travel pillow then read our guide below with travel pillow reviews to help you decide what is the best travel pillow for you. 1.1 What is most comfortable for you? 1.2 How much space will it take up? Deciding which is the best travel pillow for you is quite simple. There’s two things to think about: what positions do you like to sleep in/make you the most comfortable and can you afford to carry a solid pillow or do you want the convenience of an inflatable travel pillow. What is most comfortable for you? How do you like to sleep on the road/in the air? What position is the most comfortable? It’s very specific to the individual – what you find comfortable might not be comfortable for someone else. We all like sleeping in different positions in a regular bed. The main choice is a pillow that sits around your neck and helps you rest your head against your shoulder. Given the confined space of most seats in the rear of the plane this is a pretty natural sleeping position. It’s not surprising that most travel pillows support it and the most common type is the neck travel pillow. A similar position is to rest your head to the side, against the wall of the plane or part of the seat. This is made a lot more comfortable with a travel pillow. Once you’ve decided on the type of pillow you need to think about when it is not in use. How much space will it take up? Where will you put it when it is not in use? And how heavy will it be? Inflatable travel pillows are much easier to pack in a suitcase or bag. Pillows made of foam don’t have that luxury. So if you prefer a pillow filled with foam you’ll need to be sure you can carry it around when not in use. Many of the travel pillows for necks are small and can fit in a case if you need it to. There are a wide range of inflatable travel pillows to chose from. In addition to being easy to store when not in use, inflatable pillows can come in all shapes and sizes. Below are some of the best inflatable travel pillows for airplanes (or any other form of transport) of all shapes and sizes. 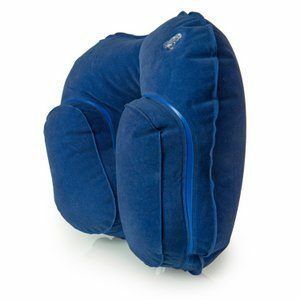 The Travelrest travel pillow is considered one of the best airplane inflatable travel pillows as it is one of the highest rated in inflatable travel pillow reviews. Supporting the head and neck it is perfect for long haul flights due to its great comfort and enduring form. The Travelrest pillow is portable, compact and inflatable and inflates with little effort. 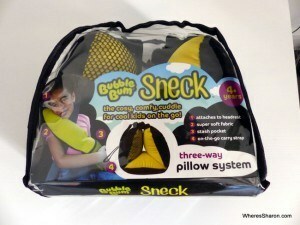 The pillow measures 10x2x4 inches and weighs 7.4 ounces making it a convenient choice to travel with. Our favourite part about this travel pillow is the unique shape that is surprisingly comfortable and the fact that it inflates so it doesn’t take up much space when not in use. The Enky Travel Pillow is another of the best inflatable travel pillows. The Enky pillow is used to support the head and neck and is unique from other inflatable travel pillows with its extra bolsters preventing the head swaying side to side or falling when asleep. The soft material feels comfortable against the skin and prevents heat build up. I like how this pillow has extra padding which helps keep my head upright when I’m sleeping and stops me nodding awake. Read more about the Enky Travel Pillow and see the latest prices. Neck pillows for travel are popular due to their ease of use and their small size. Given that your head naturally falls to your shoulder when tired in an airplane seat, travel pillows for neck and head support make a lot of sense. 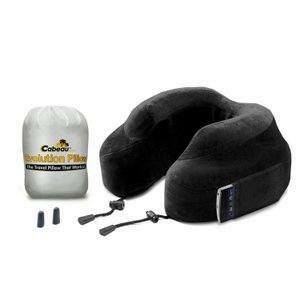 The Cabeau Memory Foam “Evolution Pillow” is one of the most luxurious neck pillows for travel. It is used to support the head and neck and, with its 360 degree head and chin support, it makes for one of the best neck support travel pillows available. The evolution pillow is incredibly comfortable with its world class memory foam and luxurious features including memory foam ear plugs. It puts an end to stiff necks and cramped sleeping positions. The dimensions are 24x25x12cm and, at a weight of only 300 grams, it wont weigh down your luggage. “The cinnamon roll” technique allows you to simply roll the pillow up for simple and easy packaging. It compresses to 1/4 its size, making the Cabeau memory foam evolution pillow a fantastic travel option. 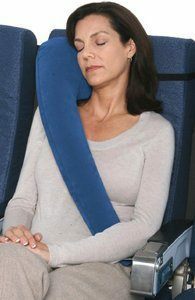 What I like best about this travel pillow is that it can also be used as a forward leaning pillow. The J pillow is one of the best neck support travel pillows available. It is used to support the head, neck and chin and is endorsed by medical professionals. The J pillow comes with the option of inflatable or plush. It is shaped like a 3D letter J which curls under the chin to support the head, stopping the head from falling, reducing stiffness and soreness. The J pillow is 11x7x13 inches and weighs 7.5 oz. It folds down small and can be squeezed into the smallest of spaces or clipped onto hand luggage with the handy snap loop fastener. 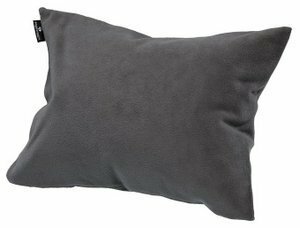 The J pillow was the winner of the best British inventions of 2013 and is perfect for those who struggle with stiffness and soreness during long haul flights/travel. I love the chin support that it provides. See more about the J Pillow by clicking here. The Skyrest Travel Pillow is a very different type of travel pillow to those reviewed so far. As an inflatable wedge travel pillow, it is designed not to rest your head against your shoulder or seat but instead for you to sleep forward. Using the Skyrest on your tray table you can lean forward to sleep at a natural height without needing to put your head on your arms or the hard table surface – both of which are uncomfortable. If you find sleeping forward more comfortable (not everyone does) then this pillow is worth considering. Most Skyrest Travel Pillow reviews note how good it is for long distance flights – but only if sleeping forward is your preferred position. Additionally some people found it not so comfortable if the chair in front is reclined in any way. The other problem with this pillow is that it is too high for some people when fully inflated. For more information on the Skyrest Travel Pillow and to see the latest prices click here. The great advantage of the Eagle Creek Travel Gear Cat Nap Pillow is its ease of use. It is extremely quick to inflate and it folds up to be incredibly compact. This makes it easy to carry around – even in a day pack. For an inflatable neck support pillow for travel, it is very comfortable. People who have reviewed it talk highly of how comfortable it is to use in a number of positions. 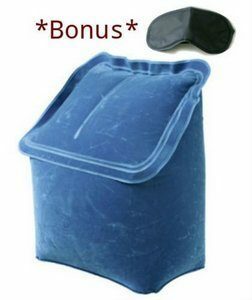 Many people have used it for lumbar support as well as head support, and it is easy to adjust the level of inflation to make it comfortable for use in any position. I like that this travel pillow comes with a storage bag and it is easy to fold it up nice and small. It’s also good for people who need a footrest. This might well be the best air travel pillow of its type. 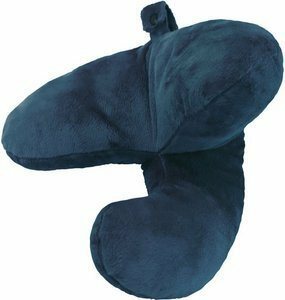 For the latest prices and reviews of the Eagle Creek Travel Gear Cat Nap Transit Pillow click here. It’s not just adults who enjoy travel pillows. Our kids love travelling with their own travel pillows as well! They each have a Sneck which is made especially for kids. Its a long pillow filled with micro beads with ultra soft material. There is also a pouch for a mp3 player. What we like about the Sneck is that it has a velcro strap so you can easily attach it to things or just wrap it around the child’s neck. We also find the strap handy so that we can attach the pillows to our back packs when they are not in use. We have used the travel pillows in cars (they can attach to head rests or the seat belt), trains, buses and planes and they have worked out very well. We have also used them as spare pillows for beds when we haven’t had enough pillows. We often only book triple rooms to save money since Mr 3 can share with us. However, we aren’t always given a spare pillow. The Sneck enables us to have a spare pillow in these situations.